Shhh ...You're invited to a Secret Wine Sale! The California Wine Club's Fall Wine Sale starts next week, but you can order now! Save up to 74% off retail prices on award-winning, handcrafted California wines, plus every case ships for just $1! If you pay much attention to the wines of New Zealand, you've likely heard of Marlborough, the South Island home of the country's most sought-after Sauvignon Blancs. You'll find the famous Cloudy Bay there, and scores of other well-known Sauvignon producers like Brancott (known as Montana outside the U.S.), Villa Maria and many more. You might have to know a little more about New Zealand, though, to have the name of Central Otago ready at your command. Most of the rest of the world knows Central Otago, if we know it at all, as the spectacular setting for many of the scenes of Middle Earth in the Lord of the Rings movies. But wine enthusiasts will recognize this region as the home of some of New Zealand's most promising Pinot Noirs. A cool climate region, it's located on New Zealand's South Island near the 45th parallel. If that sounds familiar, it may be because it's lies on the same latitude south as Burgundy in the north. Burgundy, however, for all its distinct four-season climate, isn't subject to the occasional cold southerly winds that blow up from the Antarctic Sea to chill Central Otago. This can give humans the shivers at times, but it seems to provide Central Otago's Pinot Noir vines an environment that works for them: The region has become recognized as a significant world production region for Pinot. While Central Otago's terroir is surprisingly diverse for a smallish region, from flood plains to mountains, its central location on the larger South Island assures it a four-season climate, too. Chilly winters are offset by hot summers - typically hotter than Burgundy - and long dry autumns that rarely frighten growers with unexpected storms. The overall effect yields grapes of good maturity but substantial ripeness as well. The ripe fruit sugars convert to intense wines with high alcohols, but that also show bright acidity and some complexity, resulting in a style that blends Old World and New World styles. You'll recall that we're spending this month enjoying New Zealand's pleasant wines as our Wine Focus for August in the WineLovers' Discussion Group. You're invited to bring your tasting notes, comments, questions, and thoughts about everything from food-and-wine pairing to New Zealand travel. The California Wine Club's Fall Wine Sale starts next week, but you can order now! Click here! Save up to 74% off retail prices on award-winning, handcrafted California wines, plus every case ships for just $1! Click here to shop now! Choose from hundreds of limited-production California wines including 10 mouthwatering wines priced under $10 each, 27 Cabernets from the stellar 2007 vintage, buttery Chardonnays, silky Pinot Noirs, juicy Zins and more! Every wine has been hand-selected from a small family winery by Bruce and Pam Boring, proprietors of The California Wine Club, and is backed by their 100% satisfaction guarantee. To shop the full selection of wines on sale, click here or call 1-800-777-4443. Don't wait: due to limited quantities, popular wines will sell out quickly. Act now to get the best selection of wines. WEB LINK: Here's a direct link to the winery's Cupid's Arrow 2009 Pinot tasting note. You can move up to the main Wild Rock winery page here. 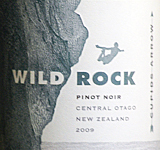 Compare prices and find vendors for Wild Rock Pinot Noir on Wine-Searcher.com.